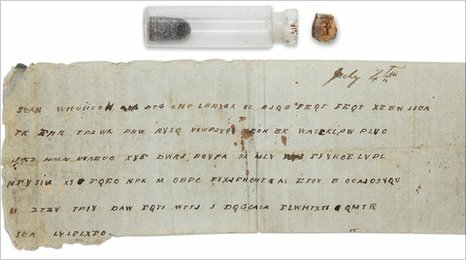 A message in a bottle delivered to a Confederate general during the American Civil War has been deciphered, 147 years after it was written. In the encrypted message, a commander tells Gen John Pemberton that no reinforcements are available to help him defend Vicksburg, Mississippi. "You can expect no help from this side of the river," says the message, which was deciphered by codebreakers. The text is dated 4 July 1863 - the day Vicksburg fell to Union forces. The small bottle was given to the Museum of the Confederacy in Richmond, Virginia, by a former Confederate soldier in 1896. Earlier this year the museum's collections manager, Catherine Wright, decided to investigate the wrapped note it contained. It was "just sort of a curiosity thing", she told the Associated Press news agency. When Ms Wright found that the message was coded, she asked retired CIA codebreaker David Gaddy to crack it - which he did in several weeks. A Navy cryptologist later confirmed the interpretation. Historians regard the fall of Vicksburg as an important victory for Union forces. The Confederates were finally defeated in 1865.